The beginner woodworkers wanted to know about correct setup procedure to follow. So, after consulting few known woodworkers, we prepared this post. How to Setup a Drill Press is an overview of the installation procedure as well as essential points to keep in mind while installing the Drill Press at our home. A drilling machine is one of the most used machines in the woodworking shop. Although, there are some considerations to be made while installing your selected best drill press at your chosen place. Here are some of the essential tips and steps we must keep in mind while carrying out setup a drill press at our workshop. Following these tips and considerations, we can easily install the Drill Press with an ease. First of all, the installation of the drill press must be done at a proper place. The shop floor engineer must consider the ergonomic considerations while carrying setup a drill press in the machine shop. There must be sufficient amount of space available to the machine operator for carrying out the machining operations with an ease. Apart from that, he shouldn’t face any kind of obstacle or obstruction while using the drill press in the shop. The land on which the drill press is installed should be at a proper level. We must avoid placing the machine on an uneven portion of ground. Otherwise, it might affect the performance of the machine and make it unstable. Due to this, we must enforce on using the machine on a leveled surface. It is also essential to provide the sufficient amount of support to the structure of the machine. In this way, we can assure its proper functionality. Initially starting with the foundation, we must make the use of bolts for installing the drill press. It is also necessary for us to check out the various safety ﻿precautions. We must supply the electric power to the drill press in a proper manner. Another thing that we need to consider is taking care of the various accessories. 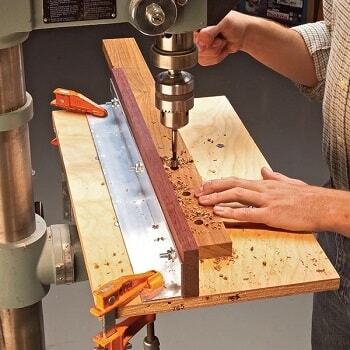 Read | How to Drill Straight Without A Drill Press? We use plenty of attachments and accessories while working with the drill press. It is necessary to be careful while using these attachments. They shouldn’t rise up as an obstacle to the operator while he is operating the machine. Moreover, they must be set in such a way that it doesn’t come into the contact with the rotating parts such as a gear, cutter and a lot more. In this manner, we can reduce the possibilities of accidents. For the proper functioning of the drill press, it is necessary for us to properly lubricate it. Lubricating the components provides it with a smoother operation and also reduces the friction in the rotating parts. Lubrication also increases the life of these parts and makes them function properly on all grounds. There are various kind of oil, grease available which you can utilize for the lubrication purpose. There are various factors that might affect your choice of selection of speed and feed of the drill press. Such as the material of the workpiece, the thickness up to which you have to make a cut and the thickness of the drill tool that you are using for making a hole in the workpiece. Properly keeping all these points in mind, we can easily determine the preferable speed for making a hole in the workpiece. We mustn’t choose more speed for carrying out the operation. It can damage both the tool as well as the workpiece. Both speed and feed are depending on each other. Hence, the operator must follow the proper Drill Bit Geometry and machine considerations while selecting the speed and feed for making a hole in the workpiece. With all these steps, we can easily setup a drill press in our machine shop. Installing any machine in our workshop requires a lot of handling and care. Otherwise, it wouldn’t deliver us with the appropriate kind of performance while carrying out drilling operation in it. 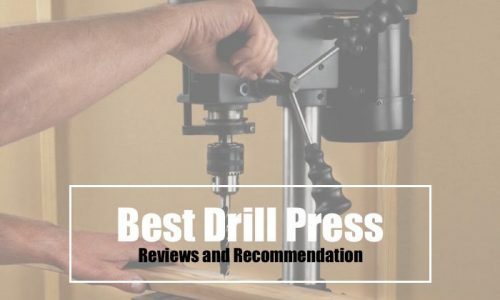 Our present article has shown us guidelines on How to Setup a Drill Press and other important steps you need to follow while installing a drill press at beingwoodworker's home.